There’s a Time for Dancing and a Time for Sitting. Dude. Sometimes you totally just need to sit one out because your umbrella is broken, there’s thunder, and lightening and you just fell off the curb, face down, and are now sitting in a knee-deep puddle of muddy water. There’s a time for dancing. There’s a time for getting your groove on. I know. I’ve done it plenty of times. But sometimes, you just have to sit one out. Nothing wrong with sitting one out. Just don’t sit too long. Get perspective, and then busta move. I’m sure the storm will still be there. 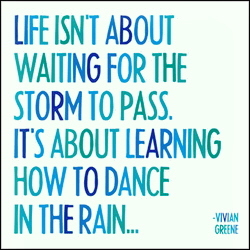 Here’s hoping you’re weathering the storms, Guat. Sometimes, it’s also about anticipating a storm and remembering to take the umbrella so you get less wet.